This is a sponsored post by Divatress. All opinions are mine. Want a way to change up your look in a flash? Well, why not try a wig? It's the absolute best way to try new styles, colors, trends, you name it ... and it's the healthiest option for your hair, since you don't have to actually do anything to it. Enter Divatress Lace Front Wigs. 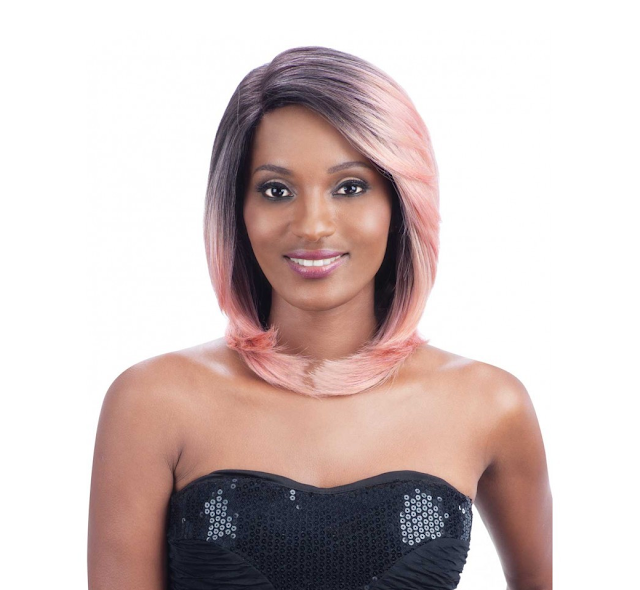 Divatress offers literally hundreds of lace front wigs. Seriously -- their website has about 800 styles to choose from! Curly! Straight! Blue! Purple! Red! Ombre! Short! Long! The choices are endless. If you're like me, you love trying different hairstyles, but you might be worried that putting pink in your hair could damage your strands or chopping it all off will be a pain to grow back. Well, thank goodness for Divatress Lace Front Wigs, right? The Divatress Maliyah Premium Seven Star Lace Front Wig. AKA the best way to try pink hair without the commitment! Right now I'm totally obsessed with pink hair -- I've been wanting to dye mine forever -- and the Divatress Maliyah Premium Seven Star Lace Front Wig (above) is definitely my favorite option for pink hair without the actual commitment! But seriously, no matter what style or color you're going for, you're sure to find it with Divatress. So if you're looking to change up your hair at a moment's notice, it's definitely time for you to check out Divatress. The lace front wigs start around $19.95 so it's the perfect way to try something new without breaking the bank! Find your favorite Divatress lace front wig at divatress.com. This is a really great way to be daring without committing your hair to a real daring choice! How fun to change up your hair without really changing your hair! My hair is so long and thick that I could never squeeze it all under a wig. LOL! I saw an older woman tonight that had pink streaks and I love it. Her hair itself was mostly gray so the pink stood out beautifully. Dark hair doesn't pick up those colors well so a wig would do the trick.